“Take me – one kiss – ”: The Active Silence in the Shelleys’ 1814 Love Letters. Hello all. First up, I’d like to thank the team at Romantic Textualities for inviting me to blog here – I hope the resulting ramblings prove interesting! In this first post I plan to introduce myself and the research that I do. In future blogs I’d like to highlight some of the things that most interest me about the materials I study and look at some peculiar or intriguing examples of those materials themselves. So, I’m a PhD student nearing the end of my doctoral research at the University of Sheffield. My thesis title is ‘From Libraries to Landscapes: Travel Writing and the Location of Gothic Fiction’ (got to have that alliteration) and I work mainly within the later eighteenth century. 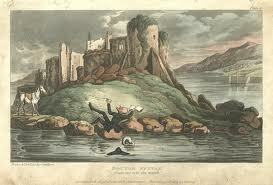 Like many another PhD students though, where I’ve ended up isn’t quite where I began. I’ve always been fascinated by the Gothic’s relationship with genre; specifically, I’m intrigued by the way the Gothic finds locations for itself in and around alternative genres that its authors, readers and critics are aware of within a wider print culture. So, at the end of my MA studies I was happily exploring the place of the Gothic within different forms of mid-Victorian popular literature, having just finished a dissertation on the (really quite brilliant and incisive) use of various popular genres by Mary Elizabeth Braddon. Following this, my initial PhD proposal grew out of an observation that the shorter fiction of Wilkie Collins and Charles Dickens often used actual or imagined travel as a framing device: a way of simultaneously locating aspects of the Gothic within different imagined geographies and in using the Gothic to harness their potential as loci for narrative. This early interest quickly became my first conference paper on Collins’s early travel-writing and framed collections. All well and good, but in the meantime my PhD itself had cheerfully developed an outline of about eleven projected chapters ranging from the origins of the Grand Tour through the effect of Walter Scott on Gothic literary tourism, something or other about monsters and wanderers as doubles of travellers, the rise of railway fiction, G.W.M. Reynolds and vicarious urban tourism, exploration narrative and later Victorian adventure fiction and the clearly very important fact that Stoker’s Jonathan Harker owns a Baedeker. . .
Not only was this initial plan clearly mad, it was also doomed to failure by the sheer amount of interesting material I discovered as I researched what was supposedly my sole eighteenth-century chapter. Extremities were accordingly lopped off until I ended up with a more manageable date-range, running from the 1760s through to the publication of Ann Radcliffe’s final novel (in her lifetime, at least) The Italian in 1797. Within these (much saner) boundaries I’m interested in charting some of the ways Gothic fiction moves from the kinds of abstracted, archival contexts provided for it in its earliest examples, out into the kinds of real geographies explored and, to some extent, maintained in different forms of travel literature. I think we’re all very familiar with the way Gothic writers at the end of the century draw upon and interpolate material from contemporary travelogues (Radcliffe being a particularly – and deservedly – famous example). This practice has been variously interpreted as a means of engaging in contemporary aesthetic discourses (and acquiring cultural capital thereby), of finding ways to abstract (and invest) the Gothic narrative within a model of benighted European Catholic absolutism or, simply, of appealing to an established readership within an expanding print culture and offering it a vicarious means of ‘travelling’ the continent during the Revolutionary and Napoleonic wars. I think there’s value in all these and other interpretations. What I’m particularly interested in though is thinking about the way different kinds of travel-writing are already doing their own work in addressing and locating the Gothic (often quite well in advance of the more famous fiction) and seeing how this maps onto the use (or lack thereof) of ‘real’ landscape in novels. There’s a fairly significant transition between Walpole’s Otranto (in which it’s apparently possible to visit multiple sites without ever actually going outside) and even an early Radcliffe novel like A Sicilian Romance which directly enacts the emergence of the Gothic within the scope of the Grand Tour: having it overlay and re-animate the landscape frequented by contemporary travellers in a way that quietly troubles our more traditional sense of the eighteenth-century Gothic as existing in a bubble of chronological and geographical abstraction. I’m interested in the way this transition might take place in travel writing itself, as well as novelists’ use of it. At heart, therefore, my work is an attempt to examine the way attitudes to the Gothic develop in another important area of eighteenth-century print culture and the ‘imaginative geographies’ it constructs for itself. This hopefully offers a contribution to some great work being done to broaden our sense of the eighteenth-century Gothic’s formation and function, by a number of excellent scholars (whose blushes I’ll spare here). In my next post I’ll talk more about some of the areas that particularly interest me in my research. 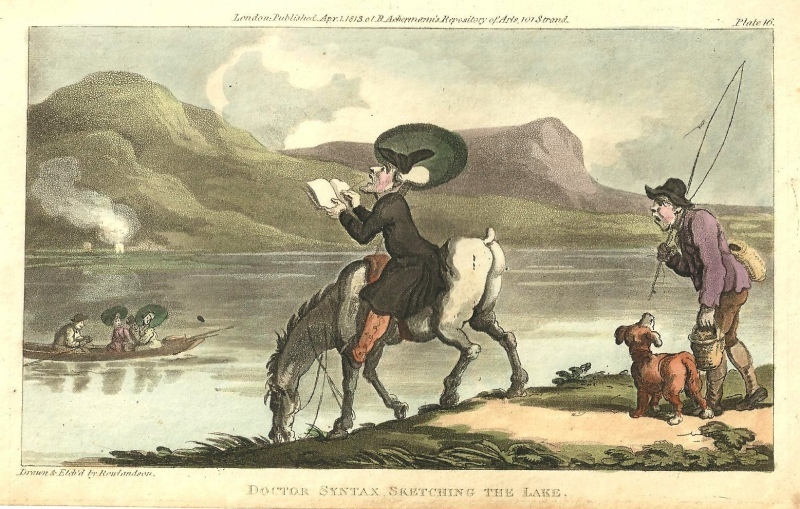 The two images in this post are both from Thomas Rowlandson’s caricatures of ‘Doctor Syntax’: a brilliant send-up of eighteenth-century Picturesque tourism and an equally appropriate figure for the enthusiasm and bewilderment that might accompany an eager PhD student, setting out with notebook in hand. . .
Mark Bennett is a PhD student at the University of Sheffield. He has published on nineteenth-century sensation and penny blood fictions and organises the Gothic Reading Group at Sheffield. He also has his own blog, but mainly uses this to gather virtual tumbleweed.